Our Aeron™ Chairs are refurbished to a high standard making them an exceptional cost effective solution, when compared to that of an Aeron chair purchased from new (RRP around £900.00 with a 12 year warranty included). As well as refurbishing our Aeron chairs, we also cosmetically restore them in order to bring each chair up to the same standard upon completion. We also replace all carpet castors, wheelbases, and seat foam inserts, plus any damaged mesh, faulty gas cylinders, split lumbar supports, and severely scratched arm pads. Our chairs are also sent out fully assembled (UK only) in official Herman Miller chair boxes (recycled), and we add additional packaging, and strapping to provide as much protection during transit as possible. Size B Aeron® Side Chair. Fitted with ..
Black Size B Aeron® Side Chair. Fitted wit.. Size B Aeron® Side Chair with Titanium and smok.. This is a Fully Loaded Aeron chair (without Arm.. 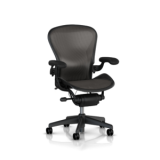 This is a Fully Loaded Aeron chair which featur.. This is a Mark II (Mk2) Fully Loaded Aeron chai.. This is a Mark II (Mk2) Fully Loaded Aeron ..
Graphite Fully Loaded Remastered Aeron Chair wi..
Polished/Executive Remastered Aeron Chair with ..